Walking through the ancient Roman city of Salona, a swathe of land dotted with 2,000-year-old stone ruins near seaside Split, Croatia, we felt a bit like Indiana Jones. We playfully feigned jubilation that we had just chanced upon an undiscovered ancient place, as we explored the remnants of the city, which was once home to more than 40,000 inhabitants. Salona is undoubtedly an archaeological gem, deserving of such praise, however, on this February day, there were only a handful of local residents at the site. We were likely the only travelers there. One pair of locals enjoyed a picnic on the lawn, surrounded by the old city walls; a woman hung laundry in her backyard which overlooks the ancient amphitheater; and another couple tended to their olive trees, on a plot of land overlooked by the mighty Klis Fortress (a site that has recently gained notoriety as a Game of Thrones filming location). When the gardening couple heard that we fancied Croatia’s delicious wild asparagus, which was in season at the time, they hunted for some in their garden. Plucking a few stalks out of the earth, they generously insisted that we take them as a souvenir to be enjoyed at dinner. Marjan Forest Park is often referred to as the “lungs of Split, Croatia.” The park’s pine forest exhales fresh oxygen into the nearby city — which is removed, but within walking distance. Marjan (or Marjan-Park Šuma, in Croatian) has been a popular recreation spot since at least the 3rd century. Back then, Roman Emperor Diocletian (who had his retirement palace built in Split) had sections of Marjan reserved as park space. Marjan also has extensive jogging, cycling, and walking trails, as well as picturesque stone churches. Many of the peninsula’s tiny chapels were built centuries ago. And if you’re lucky, you might even bump into some of Marjan’s resident donkeys. Whenever we felt the need to escape our home away from home in Split’s bustling Old Town within Diocletian’s Palace walls, we made a pilgrimage to Marjan. On a few occasions we did a bit of foraging for wild asparagus. Other times, we enjoyed a picnic among the agave plants. Most afternoons, we’d see residents walking their beloved dogs or biking. We’d also spot ferries bound for the islands of Hvar, Brač, Šolta, and Vis. And sometimes we’d even glimpse a string of tiny sailboats being piloted by sailing students out on the twinkling Adriatic Sea. The latter two sightings tempted us to embark on an island escape ourselves. As our friend’s car propelled us up the jagged slopes of Kozjak Mountain in Croatia’s Dalmatia region, we struggled to steady our cameras enough to document the increasingly-magnificent view. Simultaneously fearing for the health of my friend’s tires which risked being ruptured on the rocky dirt road, I marveled at the panorama along this stretch of Croatia’s Dalmatian Coast. In the late-afternoon sunlight, the Adriatic Sea twinkled, and despite technically being wintertime, it called us to take a plunge. The limestone hills overlooking seaside Split and Kaštela wore a blend of foliage. Some trees sported withering, rust-colored leaves from the past season, and others prematurely exhibited pastel blooms and berries. As our Croatian friends had been telling us for weeks, the winter had been unusually warm, raising concern that the flora would be adversely impacted should another cold snap roll in. Given that so many locals dabble in the Mediterranean tradition of winemaking and olive oil production, this did not come as a surprise. As we perused the holdings at the Split Archaeological Museum along Croatia’s Dalmatian Coast, I found myself most drawn to the stone headstones bearing family portraits of citizens from the Roman Empire – some more than 2,000 years-old. Though the subjects’ faces were often weathered and lacking facial extremities, I enjoyed pondering how the family’s likenesses came to be carved out of stone. Had they sat for the sculptor for hours? Had they worn their best apparel, or had the sculptor depicted them in an idealized fashion? Could they ever guess that visitors would size them up thousands of years later? 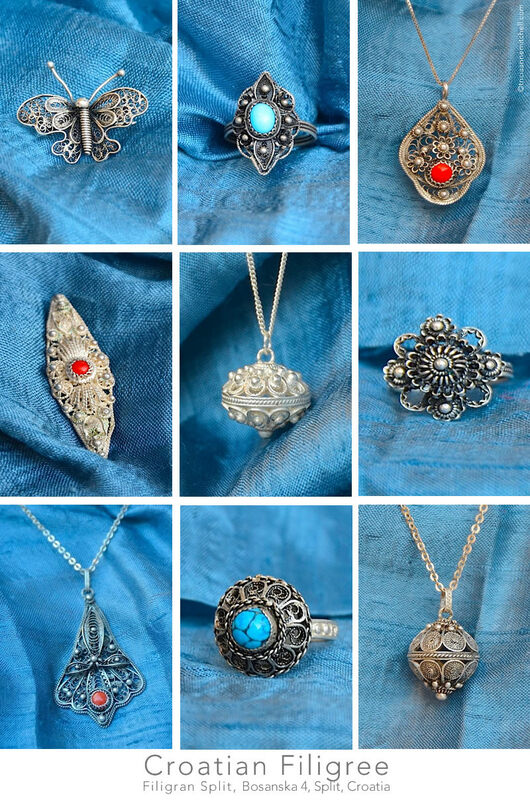 Master filigree jeweler Viktor Čivljak has a gentle and humble manner despite regularly wielding blow torches and hammers in his making of Old World jewelry. It turns out that the 73-year-old Split, Croatia jeweler also has a penchant for survival, something that we would learn while spending a Saturday afternoon with him, watching step-by-step how to make a pair of intricate filigree silver earrings. Viktor and his wife, Flora, along with son Lorenc, who is working to become the family’s fourth-generation jeweler, sell their tiny traditional silver treasures in an intimate shop, Filigran Split, located just outside of the 1,700-year-old walls of Roman Emperor Diocletian’s Palace. Croatia has no trade school for learning the art of making filigree jewelry and in order to become a filigree artist, one must apprentice. Typically family members carry on the jewelry-making tradition, or one approaches a master to request that he take him on as a student. Viktor’s grandfather, Josip, was the first in the family to learn the art, then came father Lorenc, and then Viktor, who began shadowing with his father at the age of 13.